Reggae music is everything that the creators of Esperanto had hoped that Utopian language would be. I have met people from all corners of the Earth and despite linguistic differences, we have managed to communicate and become friends based on a shared love of the music and its language of riddims, roots, dusty 45s and impeccable harmonies…not to mention patois which many foreigners learned before they ever spoke English. So it was that I met Shiego Sonny in New York. At the time he was living in Brooklyn and part of a group of brilliant Japanese chefs who were also deep reggae lovers and selectors. I ate his food at Bozu and Samurai Mama (which despite its silly name, turned out some of the best Japanese home-style cuisine in the city.) A few years back, Sonny returned to Tokyo to open a Mexican restaurant. As everyone should know, super talented Mexican chefs abound in New York and have found grateful employment in the kitchens of great NYC restaurants of all types. Fortunately for the world, this has created some wonderful cross-cultural food discussions not to mention an explosion of top class Mexican restaurants in New York. In February 2015, I was in Tokyo and dined at Sonny’s restaurant, Kitade Shokudo. The food was great, the tortillas were hand-made and Sonny’s love for authentic Mexican food shone through. Without having ever eaten Mexican food in Japan, I guessed Kitade Shokudo had to be amongst the best in the city. So, last night I decided to return with my wife and kids and two friends visiting from New York — one of whom is actually Mexican and the other from Italy. Kitade Shokudo is located in the East Side of Tokyo in the Kodemmacho neighborhood. This is the old Tokyo, close to the temples of Asakusa, the electronics crossroads of Akaharbara and the kitchen wonderland of Kappabashi. The restaurant is located about fifteen minutes away from the train station so we tramped together down the quiet streets. It feels older in this part of Tokyo, a sort of dustiness and a glimmer of what the city must have looked like in the post World War 2 era — faded advertisements, traditional wooden architecture, a passing whiff of sewage and the faint sense of hard times past. It reminded me, in some ways, of TriBeCa in the early 90s with cute boutiques, cafes and restaurants rubbing shoulders with the grizzled remains of stores that have been selling the same five Spaldeen rubber balls for 30 years. Kitade Shokudo is beautiful — two stories of an old perfume factory kitted out with warm wood, painted concrete and the sweet glow of welcome (and the lilting strains of rocksteady) pouring out into the street. The restaurant has evolved since my first visit. There is now a taco menu and a more straightforward Japanese menu with a chalkboard for daily specials. We started with a special of fluke ceviche over avocado and a dish of thick, perfectly crisp, fried potatoes with rosemary. In Japan, service is always attentive, gracious and polite from the counter workers at 7-11 to the roughest, dirtiest yakatori spot. The service at Kitade Shokudo did not deviate from that norm, but there was something more casual, more eccentric maybe about the staff which made it particularly charming and added to a room bubbling with laughter and a giddy sort of free spirit. We were served a perfect guacamole and chips and a dish of octopus, fennel and mushroom which tasted so positively Tuscan that our Italian pal swore it could be a Papradelle with porcini. We swooned over a slaw of purple cabbage, crumbly Mexican cheese and nuts. The beers were wonderfully cold, the ginger ale was made fresh with Brooklyn Ribbon Fries Ginger Syrup and there was a welcome assortment of 100% organic sodas and juices The tacos arrived as a kind of do-it-yourself assortment of fried fish, garlicky shrimp, long simmered pork, mushrooms and chorizo served alongside freshly made tortillas, limes and a variety of salsas including a richly flavored, incendiary Habernero sauce that could have made a rubber band taste delicious. Not for nothing, but the earthy aroma of freshly made corn tortillas is one of my all time favorite things. We ended with 3 plum sized korroke (Japanese potato croquettes) in a smoky chipotle sauce. We were a satiated group and the Italian actually enjoyed his food (although he had a brief moment of panic when he mistook the purple cabbage for raddichio). But, is Kitade Shokudo still actually a Mexican restaurant? Yes and no. In serving size and presentation, the food is absolutely Japanese. 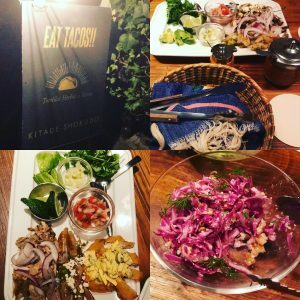 In the dishes, the tacos, the food has veered from strict authenticity into incorporating Mexican flavors for a more Japanese palate. And yet, there is nothing goofy about the food, no Mex-Asian fusion shrimp tempura taco with Yuzu glaze — in fact, my Mexican friend, relishing in the fresh tortillas and the crunchy sweetness of the fish, said “This is just a great taco.” As, I mentioned, Kitade Shokudo has evolved, it has grown into its glorious space and matured from a paean to authenticity into its own unique style of cuisine — which is really a very good thing for the hungry people of Tokyo. Great post SJ. Now I have two Freemans to follow.